The edge is gone. Doubt doesn’t hang over the horizon, growing with every step. Instead it fades behind me, disappearing as the white-capped mountains surrounding Gotthard Pass slip away behind the curve of the valley. 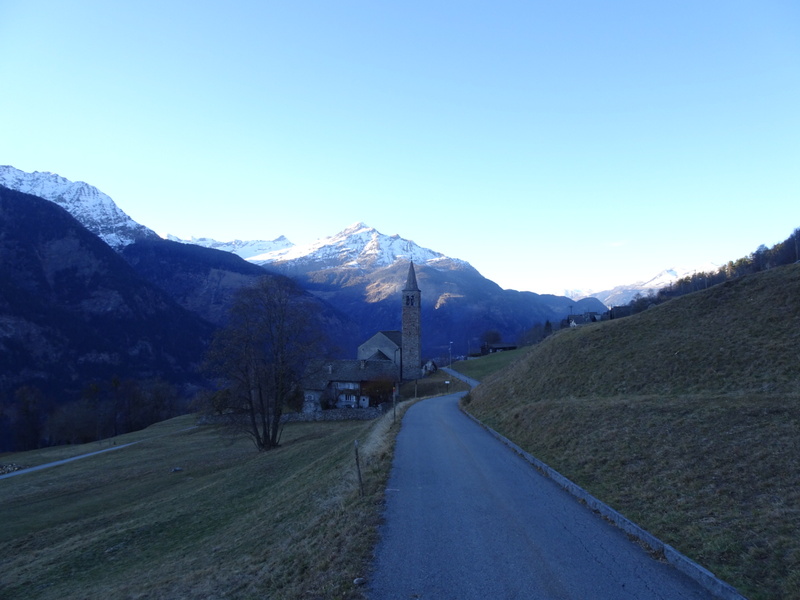 A blue sky stretches overhead as I walk along a high path, through the streets and narrow passages in small villages that hang along the slopes, past churches perched to overlook the world. Mountains and ridges come and go, their faces turning as I pass. Smoke from a fire drifts up across the way as two helicopters drop water. It isn’t the time for fires, but it isn’t the time for Floridians to cross the Alps either. It is an odd, dry winter. As the day fades, the trail drops down, forced to the valley floor by a side valley coming in from the east. Stars flicker to life in the sky as the and the lights of houses, cars, and streets fill the valley. Civilization is thick on the floor, emerging from tunnels and crowding in the flat ground like it did on the far side of Gotthard. I walk for an hour in the dark, watching the stars, ghosting through town streets, disappearing into a stretch of forest. I decide to camp in the fallen leaves, leaving my tent in my backpack for the first time in months. The risk is worth laying back and staring through the naked branches to catch stars shooting across the sky. Posted in Europe North to SouthTagged backpacking, cowboy camping, ENS, Europe North to South, featured, hiking, starsBookmark the permalink. Sounds like you are enjoying the snowless part of Switzerland. The season is more like fall and your sleeping under the stars. Pretty soon you will be replenishing your FL tan on the Italian and French Riviera. Happy trails! Nice to be outside the tent, I imagine!